Query Tool (using ODBC) is a Universal Data Access (UDA) tool. 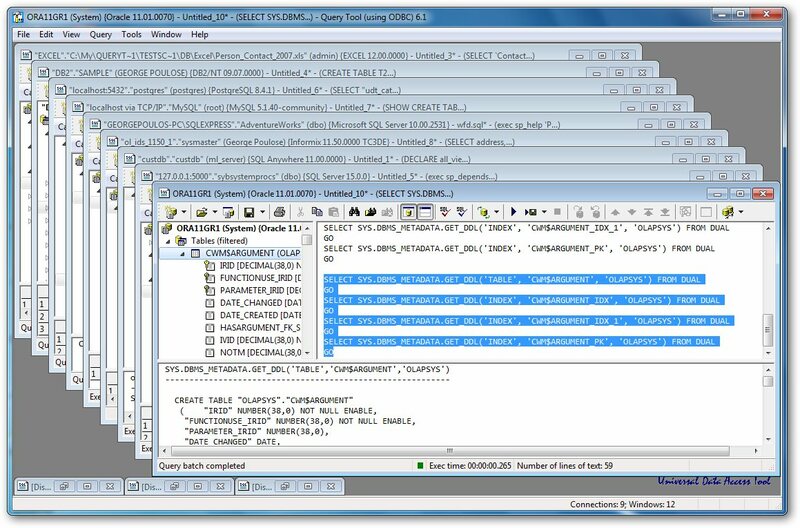 It lets you query ODBC data sources, author SQL scripts and queries, execute multiple SQL scripts or stored procedures simultaneously, return query results to a grid or free-form text, retrieve ODBC driver information, and more. Supported OSs: Windows 7/Server 2008/Vista/Server 2003/XP w/ SP2; Related Products: Query Tool (using ADO) x86 and x64 and Query Tool (using ODBC) x64. ...... with SP2 or later; Free upgrade to Query Tool (using ODBC) 7.0 x64 Edition; Related Products: Query Tool (using ADO) x86 and x64 Editions and Query Tool (using ODBC) x64 Edition. Qweas is providing links to Query Tool (using ODBC) 6.1.8.8 as a courtesy, and makes no representations regarding Query Tool (using ODBC) or any other applications or any information related thereto. Any questions, complaints or claims regarding this application Query Tool (using ODBC) 6.1.8.8 must be directed to the appropriate software vendor. You may click the publisher link of Query Tool (using ODBC) on the top of this page to get more details about the vendor.